I remember the children’s game called “hopscotch” being a favorite of mine as a young kid. Also known as “potsy” (mainly in New York City), it involves tossing of a stone into a pattern of rectangles drawn on chalk on the ground. After tossing the stone into the correct square, the player hops through the rectangular pattern, pausing to retrieve the stone. The Coho salmon is dark blue with silver along the side of its body, but only during the phase of its life while it is in the ocean. When spawning and heading up into a freshwater river, the Coho has bright red sides. The Akita breed of dog is named for its point of origin, the Akita Prefecture in Japan. When Helen Keller visited Japan in 1937, she asked for and was given an Akita breed of dog, with the name of Kamikaze-go. Sadly, the dog died within a year from distemper. The following year the Japanese government officially presented Keller with a replacement dog. Supposedly Keller’s dogs were the first members of the breed to be introduced into the US. “RSVP” stands for “répondez s’il vous plaît”, which is French for “answer, please”. A nor’easter is a storm that blows from the northeast. The rideshare service Uber takes its name from the English colloquial word “uber” meaning “super, topmost”, which in turn comes from the German “über” meaning “above”. “Tommy” is the fourth album recorded by the British band called the Who. “Tommy” was the original rock opera and was adapted for both the stage and screen, with both adaptations becoming huge successes. The title character has an uncanny ability to play pinball, giving rise to the hit song “Pinball Wizard”. We’ve been using the phrases “first string” and “second string” in athletics since the mid-19th century. The expressions come from archery, in which a competitor would carry a second bowstring in case the first bowstring broke. The paten and chalice hold a special place in many Christian services. The paten is the plate that holds the bread and the chalice the wine, used to represent the body and blood of Christ. An oast is a kiln used for drying hops as part of the brewing process. Such a structure might also be called an “oast house” or “hop kiln”. The term “oast” can also apply to a kiln used to dry tobacco. The Episcopal Church in the US is a branch of the Anglican Communion, and so is associated with the Church of England. The Episcopal Church is descended from the Church of England’s presence in the American colonies, prior to the American Revolution. The American Anglicans split with mother church, largely because the clergy of the Church of England are required to swear allegiance to the British monarch. Members of the Episcopal Church are known as Episcopalians. “Episcopal” is an adjective and “Episcopalian” is a noun. “Tapa” is the Spanish word for “lid”, and there is no clear rationale for why this word came to be used for an appetizer. There are lots of explanations cited, all of which seem to involve the temporary covering of one’s glass of wine with a plate or item of food to either preserve the wine or give one extra space at the table. An hors d’oeuvre is a first course in a meal. “Hors d’oeuvre” translates from French as “apart from the work”, really meaning “not the main course”. In Spanish, “cuatro” (four) times “dos” (two) is “ocho” (eight). The Dominican-American baseball player David Ortiz has the nickname “Big Papi”. After each home run that Ortiz scores, he looks upwards and points to the sky in a tribute to his mother who died in a car crash in 2002 when she was only 46 years old. iChat was introduced in 2002, and was Apple’s “instant messaging” application that integrated with the Mac Operating System. iChat was replaced by Messages. The word “lecher”, one who debauches, came into English in the 12th century. The original word in Old French was “lecheor”, literally “licker”. Para-aminobenzoic acid (PABA), or now its derivatives, is the “active” ingredient in sunscreens in that it absorbs UV radiation. PABA derivatives are used today as PABA itself fell out of favor due to its tendency to stain clothes and to cause an allergic reaction in some users. A po’ boy is a submarine sandwich from Louisiana. There are a lot of theories about where the name came from, and none sound too convincing to me. A po’ boy differs from a regular submarine sandwich in that it uses Louisiana French bread, which is soft in the middle and crusty on the outside. Toyota management likes the idea of naming their cars after the word “crown”, as they did with the Toyota Crown, followed by the Toyota Corona (Latin for crown), the Toyota Corolla (Latin for small crown), and the Toyota Camry (Japanese for crown). Op art is also known as optical art, and puts optical illusions to great effect. Bavaria in southeast Germany is the largest state in the country. The capital and largest city in Bavaria is Munich. The taxonomic name for the killer whale is “Orcinus orca”. The use of the name “orca”, rather than “killer whale”, is becoming more and more common. The Latin word “Orcinus” means “belonging to Orcus”, with Orcus being the name for the Kingdom of the Dead. We use the word “siesta” to describe a short nap in the early afternoon, and imported the word into English from Spanish. In turn, the Spanish word is derived from the Latin “hora sexta” meaning “the sixth hour”. The idea is that the nap is taken at the sixth hour after dawn. To mewl is to cry weakly like a baby, with “mewl” being somewhat imitative. Beauxbatons Academy is magic school in the South of France, in the “Harry Potter” universe. The names “Beauxbatons” is French for “beautiful wands”. And, the students of Beauxbatons are stereotypically “beautiful” characters. Max Ernst was a painter and sculptor, and a pioneer in the Dada movement and Surrealism. Ernst was born near Cologne in Germany in 1891 and he was called up to fight in WWI, as were most young German men at that time. In his autobiography he writes “Max Ernst died the 1st of August, 1914”, which was a statement about his experiences in the war. In reality, Ernst died in 1976 having lived to the ripe old age of 85. Leon Spinks is a retired professional boxer and former heavyweight champion. Spinks won the title in 1978 in an upset, defeating Muhammad Ali in a split decision. That championship win was only his eighth professional fight. Staccato is a musical direction signifying that notes should be played in a disconnected form. The opposite of staccato would be legato, indicating long and continuous notes played very smoothly. The flavor extract we call “vanilla” comes from the pod-like fruit of climbing orchids belonging to the genus Vanilla. Genuine vanilla is a relatively expensive spice, second only to saffron, due to the amount of work required to grow and harvest the fruit (also called “beans” and “pods”). Spanish and Portuguese explorers came across the Vanilla orchid while exploring the Gulf Coast of Mexico. They gave it the name “vainilla” meaning “little pod”. A fresco is a painting created on a moist plaster, usually on a wall or ceiling. The plaster is “freshly” laid when the image is created, and “fresco” is the Italian for “fresh”. Traditionally, a tithe is a payment of one tenth of a person’s annual income and is usually given to a church. Tithing is a practice taught in many traditions, and according to a 2002 survey, about 3% of American adults donate 10% or more of their income to a church. A beau (plural “beaux”) is the boyfriend of a belle, a young lady. “Beau” and “belle” are the masculine and feminine forms of the French word for “handsome, beautiful”. In the West we tend to think of yoga as a physical discipline, a means of exercise that uses specific poses to stretch and strengthen muscles. While it is true that the ancient Indian practice of yoga does involve such physical discipline, the corporeal aspect of the practice plays a relatively small part in the whole philosophy. Other major components are meditation, ethical behavior, breathing and contemplation. 51 “Slow down!” : EASY! LAT: 11:01 (! ), no errors. Lot harder than the norm. WSJ: 17:27, no errors. Ditto. Newsday: 6:34, no errors. have vastly improved. Tough level of competition, but sure fun to try. I thought today’s LAT’s grid was more difficult than a typical Wednesday. No final errors but some tricky cluing/esoteric answers. The WSJ puzzle was also difficult. The NW corner had me going in circles and muttering to myself for a fairly long time before I finally straightened out my mistakes. When that corner fell the puzzle was complete. Whew! This whole week has been a struggle. Phew, I’m tired!! And I’m still working on the Sun. NYT. Glad to know I’m not the only one that thinks the puzzles have gotten harder. Just learning how to conquer the crossword puzzle. Still am slow and learning. Anyone know of any good resources, print or electronic, to hone my skills? This was helpful. Thanks. Still struggling with getting the theme, like Thursday puzzle, but at least I understood once it was explained. Whew, so much to learn. Thanks for your help. I could tell you a whole lot that I’ve learned over the past 4 or 5 years I’ve been doing these, but unfortunately these comments have a way of being lost. Kind of the same with a random blog post to my crossword thoughts blog. Been thinking about recording some videos of me doing crosswords and explaining certain things, but I haven’t gotten the energy and will up yet to do it. Especially since my Internet connection isn’t that good for uploading them… It wouldn’t be anything “expert” by any means, but it’d serve for the neophyte trying to get used to them. That said, what Jeff wrote is good. All you can really do to get better is to do crosswords. Part of the reason I accumulated the list on my website is to tailor it to people like you (or what I was), especially since I found it hard to find things I knew that were my level to play with. I heavily suggest you check that list out. But like Jeff said, don’t back away from trying anything even if you bomb out right way, only Google what you need to continue, and be sure to finish every grid you encounter, then study the grid and see how they arrive to the answers from the clues. That said, studying word lists will actually help you to a certain extent. Given the nature of crosswords, there’s certain “ideal” words that show up repeatedly (vowels mainly, like ULEE or ETUI). 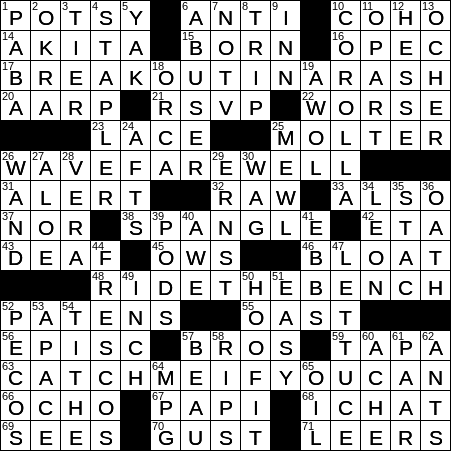 I can’t link it or it’ll drop this comment into Bill’s spam queue, but on my blog there’s a post called “Wall Street Journal Crossword: Most Used Words For 2017”. While there are many other sources, this is a good example of the kind of word list that would be useful to study – you could probably expand it to 200 or 250 though to be safe (that said I’m half-tempted to see if I can make a list with a bigger sample of puzzles). If you don’t know a word on that list, it’s good to get to know it. Anyway, if you have questions, we’re always willing to help. Another thought: A lot of crossword ability depends on word-awareness, so to a certain way they are vocabulary tests. If you don’t know a word is a word, it’s going to make it hard if that word shows up in a puzzle. Probably the best way to do that is to be well-read. Not necessarily dictionaries but other stuff like newspapers and books, and find something challenging. For example, I’m reading a scientifically oriented book at the moment where the author happens to be using lots of words I would drop into a crossword in 2 seconds as a constructor. It’s slow reading, but it’s helping me in more ways than just one. 15:13. Agree “Catch Me If You Can” was a great movie. You can Google the real Frank Abagnale and see how much of that movie was fact vs fiction. There’s a lot of both in that movie. I’ve always thought the best resources for learning to do crosswords are……crosswords. Because they are indeed puzzles and not vocabulary tests, you can’t learn to do them by reading a dictionary or something. Just work through them, Google what you need to in order to finish, and go from there. Just do as many as you can like that and eventually you’ll need Google less and less. Had to Google 2: The main clue, because it wasn’t in my memory that this was a Spielberg movie; and PAPI, cuz sports is my very weak spot. Ones I got but did not know: PECOS, RIDE THE BENCH (also sports. Thought it was about violins. ), AFTS (is this common, now?) ICHAT (never knew it existed). This is the 2nd time I’ve seen OP ART referred to as dizzying or disturbing. I actually like it and don’t think of it that way. 12 mins 22 sec, and no errors, thanks to a total guess gone right on the first square. 1A and 1D were both completely dirty pool, far as I’m concerned. Consistent with above, I did a list of the 250 most used words in crosswords, for the PUZ files I possess. The metric of “most used” seems to be a good starter, but I’ve wondered a lot of times about using “percentage of the word that is a vowel” to be able to catch the weird words (like ETUI) for a new crossworder to study. I don’t know how well that’ll work, but might be good for another day. Moderately difficult Wednesday for me; took around 25-30 minutes with no errors, although I was nervous about two squares. Remembered Matins from doing puzzles, but pretty much thought it was the Pecos river and finally went with “P” instead of “M.” Also, wasn’t familiar with PAPI and couldn’t figure out where patches went, until I did an alphabet stream…worked it out. Off to bed early for my market tomorrow. Hopefully sales will be better than last time. At least the weather will be great! Also didn’t think right off of CATCH ME IF YOU CAN, as I don’t associate it with Spielberg.